As part of its mission, Turface has always been dedicated to educating customers and communities about field maintenance and construction. That starts with our abundant resource and video libraries on our website and extends to the many exclusive partnerships we’ve established through the years to host educational events and other opportunities. Here’s a look at our multi-level approach. The Turface Grounds Crew program offers access to industry-leading education, on-field consultation, premier products and exclusive offers. Our Grounds Crew will host educational events across the country, where you’ll be invited to learn new field maintenance techniques and see products and solutions that can help you provide safer, more playable fields. Sign up to join the Turface Grounds Crew at TurfaceGroundsCrew.com. Topdressing tips, how to apply soil conditioners, reducing wear on the mound, these are just a few of the topics you’ll find in our video library. Then, our resource library has industry articles, along with product information and data sheets for a deeper dive into the world of field construction, renovation and maintenance. Turface also partners with trade associations to host field days with engaging and relevant presentations, equipment demos, and networking for industry professionals. 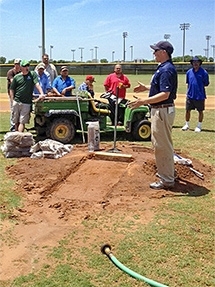 Presentations may cover subjects such as: soil testing, field maintenance techniques, painting, mound and plate repair, and more. Turface engages in sponsorship opportunities with groups like the NFCA (National Fastpitch Coaches Association) and the ABCA (American Baseball Coaches Association) to encourage and promote understanding of field safety and upkeep. 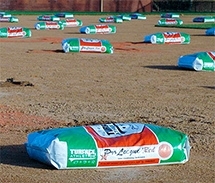 Turface sponsors the NFCA “Field of the Year” award, which recognizes additions and enhancements of softball facilities. Turface also sponsors the ABCA (American Baseball Coaches Association) “Field Maintenance Awards,” which honors schools that have invested time and resources into field maintenance and safety.